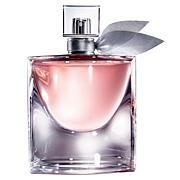 Lancôme La Vie Est Belle L'Eau de Parfum - 1 oz. 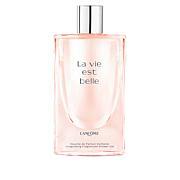 A giftable trio of eau de parfum, body lotion and shower gel fragranced with the elegant, happy fragrance of Lancome's La Vie Est Belle. 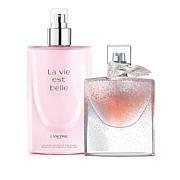 A luxurious moisturizing fragrance body lotion scented with La Vie Est Belle. LANCOME La vie est belle Shower Gel 1.7 FL. OZ. Ingredients: 947019 7 B191971/1 Aqua/Water, Sodium Laureth Sulfate, Parfum/Fragrance, Coco-Betaine, Glycerin, PPG-5-Ceteth-20, PEG-60 Hydrogenated Castor Oil, Sodium Chloride, Sodium Benzoate, Ceteareth-60 Myristyl Glycol, Salicylic Acid, Linalool, Benzyl Salicylate, Limonene, Benzyl Alcohol, Polyquaternium-7, Alpha-Isomethyl Ionone, Hexyl Cinnamal, Citronellol, Coumarin, Sodium Hydroxide, Citric Acid. 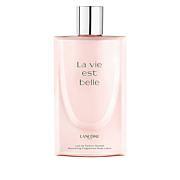 I have been using La Vie Est Belle since it came out and I still love it .I get so many complements on it. It Does make you fill beautiful, I only wish I could find a dress like the one Julia Roberts wears in the ad, that would be complete. I love this perfume, it stays on you all day. Great buy. I prefer pretty florals and this didnt do well with my body chemistry. Smelled shrill not soft and the dry down continued strong. Im very fair thin skinned.